ANNUAL MEETING DISCUSSES DISTRICT FUNDS. The annual meeting of the Winchester and Portsmouth Diocesan Guild was held at St. Mary's, Portsea, on Saturday. There was brilliant weather, which might have offered a strong inducement to visiting members to tarry by the sea, but they turned up in considerable numbers for the business meeting held in the afternoon in the Parish Institute. The Master (Mr. G. Williams) presided, supported by the hon. treasurer (Rev. Evan Jones) and the hon. secretary (F. W. Rogers). Members were present from Bishop's Waltham, Basingstoke, Bishopstoke, Blackmoor, Dibden, Fareham, Godshill (Isle of Wight), Highclere, North Stoneham, Overton, Portsea, Portsmouth, Petersfield, Ryde and Sandown (Isle of Wight), Southampton, Swanmore, Titchfield, Twyford, Ventnor (Isle of Wight), and Wickham, with visitors from Brighton and Woking. Of cathedral-like proportions; externally it is faced with flints. The meeting was to have been held at Petersfield, but the hon. secretary explained that the Vicar of Petersfield was sorry it was not convenient to go there that day as he would be away on his holidays and the curate had left the parish. The alternate vote at the last meeting had been for Portsmouth, but the arrangements in connection with the Cathedral Pilgrimage had made it impossible to go there. The Vicar of St. Mary's, however, readily granted them permission to hold the meeting at Portsea. The secretary also mentioned that apologies for absence had been received from a number who were unable to attend. The master in his report said the Guild might well congratulate the district officers on the financial position. The 50 per cent. paid over to the hon. treasurer for the year must be a record one, viz., £72 12s. 9d. Although the number of active members was slightly down, this was made up for by additional life and honorary members. The increase in finance seemed to imply that the smaller districts worked more efficiently. Bell augmentation and restoration went on steadily. The addition of two trebles to the fine ring of eight at St. Mary's, Southampton (given by the Barron Bell Trust) had made a magnificent ring of ten, and other jobs were in progress. The Guild's thanks were again due to the trust for the kind consideration of the applications made to them. Thanks were also due to the various incumbents for readily placing their bells at the disposal of the Guild during a week's ringing tour in September last; to the whole of the officers for a successful year's work; and to the life and hon. members for their support. The hon. treasurer submitted the accounts, which had been printed. In the treasurer's account there was a balance of £59 15s. 9d. from 1932 and £72 12s. 3d. received from the eight districts; £30 10s. was transferred to the general purposes fund, £7 to the general secretary's account, and £31 16s. 5d. disbursed in the general expenses, leaving a balance of £62 2s. 9d. in the bank and 19s. 4d. in hand. The general purposes fund, which forms a deposit account, began the year with a balance of £35 4s. 10d. It had been added to by the transfer of £30 10s. from the general account and 7s. 3d. interest. £2 2s. had been given to a restoration scheme at Ryde and £2 2s. to Leckford, leaving £62 8s. 1d. in the bank. The hon. secretary's fund had a balance of £3 16s. 7½d. in hand. Mr. G. Pullinger suggested they were not getting sufficient interest on their deposit account, and thought they should transfer some of the money to the Post Office Savings Bank, where they would get 2½ per cent. and the money would be on easy call if wanted. The Treasurer said they might have less money at their disposal later on if the motion on the agenda was carried. It had also been suggested in committee that they might spend more in propaganda. It was decided to place £30 of the balance in the Post Office Savings Bank in the names of the Master and hon. treasurer of the Guild as trustees. The whole of the officers were re-elected en bloc, Mr. Pullinger, who proposed this, remarking that they had a good lot, and it would be a mistake to change them.- Mr. Tucker seconded, and added the thanks of the Guild to the officers for their services.- The Master and hon. secretary briefly replied. The latter said he did not try to please everybody, but if he had displeased anyone he hoped he had not hurt them too much. The executive officers are: Master, Mr. G. Williams; hon. secretary, Mr. F. W. Rogers; hon. treasurer, Rev. Evan Jones; recorder of peals, Mr. C. E. Bassett; auditor, Mr. G. Smith. DISTRICT CONTRIBUTIONS TO BE LESS. Mr. Pullinger proposed that rule 8 be altered to reduced the contribution of the districts to the general fund from 50 per cent. to 40 per cent. of the contributions of honorary and ringing members. He said when the Guildford people broke away from the old Guild and formed a Guild of their own, and the Winchester and Portsmouth Guild decided to form smaller districts, the 50 per cent. contribution to the general fund was looked upon as an experimental figure. He considered the time had now arrived when they could reduce the amount of that contribution and so keep more money in the districts, where it could be spent with advantage to the Guild, by enabling the districts to do more work. They would be able to do more in making grants for restoration work and show those whom they were trying to interest that they were not put to take all the time, but that they were willing and ready to give. He did not think the reduction of ten per cent. would, in the long run, make much difference to the central fund, for he believed it would be made up by an increased membership. The money retained by the districts would be spent in the districts, and he thought the Guild as a whole would benefit by it.- Mr. Stone seconded. Mr. W. T. Tucker said this proposal would make the rich districts richer, but would not do much to help the small districts. He would like to see their funds centralised, and in any case he did not think a district should retain a balance of more than £3 at the end of any year. The district balances ought to be paid over to the treasurer and invested. Mr. W. Linter supported this view. Mr. Pullinger said the districts used to pay over their balances under the old rule, but while some sent in 67 or 70 per cent. others spent far more and contributed much less to the central fund. Under the present rules they all contributed the same percentage, and that must be fair. It was up to every district to make itself solvent. He was against centralizing the funds. They wanted "home rule" for the districts, and if they centralised the money they took away the power of the districts, and the districts would lose interest. The Hon. Treasurer thought they ought to give more instead of less power to the districts. He thought it would be a tremendous help. He believed the work of the Guild was greatly stimulated where they were able to make small grants for restoration work, and some districts could do a lot because they had a good deal of money. He thought those districts that had the money ought to spend more in advancing the work of the Guild, and he supported the resolution. The Master said the executive committee at their meeting that morning unanimously supported the resolution. The Treasurer thought their rules might be amended so that small districts in need of money might be able to get help from the general fund. Mr. L. Duguid, St. Mary's, Portsea, and Mr. A. A. Walsgrove, North Stoneham, were elected members of the Guild. Basingstoke was selected for the next annual meeting, with Southampton as the alternative place. The Hon. Secretary read the letter received from the Editor of "The Ringing World" with reference to the scheme for sending to Australia albums of photographs of the cathedrals and notable churches. He said the Guild would be honoured by having two of its members in the party who were going to Melbourne, the Rev. E. Bankes James and Mr. W. Linter, and the scheme should therefore specially appeal to the Guild. It had been discussed by the committee, who thought they ought to give it hearty support, but, in order that no unpleasantness should arise as to the towers selected, they suggested it should be restricted to the two cathedrals. At the request of the hon. secretary, Mr. J. S. Goldsmith gave further details of the scheme, and on the motion of Mr. G. Pullinger the committee's recommendation to present photographs of Winchester and Portsmouth Cathedrals was agreed to. A GIFT TO THE CENTRAL COUNCIL. The Master, as one of the Guild's representatives on the Central Council, briefly reported on the meeting at Warwick and, referring to the motion with regard to the falling-off in "first pealers," said Mr. Atkins, the mover, told a very doleful tale and seemed to have been canvassing the grumblers in his district. He (Mr. Williams) was able to tell the Council what was happening in their own Guild. Mr. W. Barton, another representative, in a written report said to his mind the most useful feature of the Council's work was the opportunities which the meetings afforded of informal discussions between representatives of the different guilds and associations upon matters affecting the Exercise as a whole, and upon methods relative to the organisation and management of ringing bodies both diocesan and parochial. He did not think the time spent in discussing Mr. Atkins' motion was wasted. It brought out many interesting expressions of opinions, and Mr. Williams' remarks at the meeting adequately expressed the point of view of their own Guild. Mr. G. Pullinger, who also attended the meeting, called attention to the fact that the Council desired to collect the county bell histories for the library. He thought it would be nice if that Guild would present to the Council a copy of the history of the bells of Hampshire, written by the late Rev. W. E. Colchester. It was not complete, but it was the only book there was.- Major Stilwell seconded, and this was agreed to. 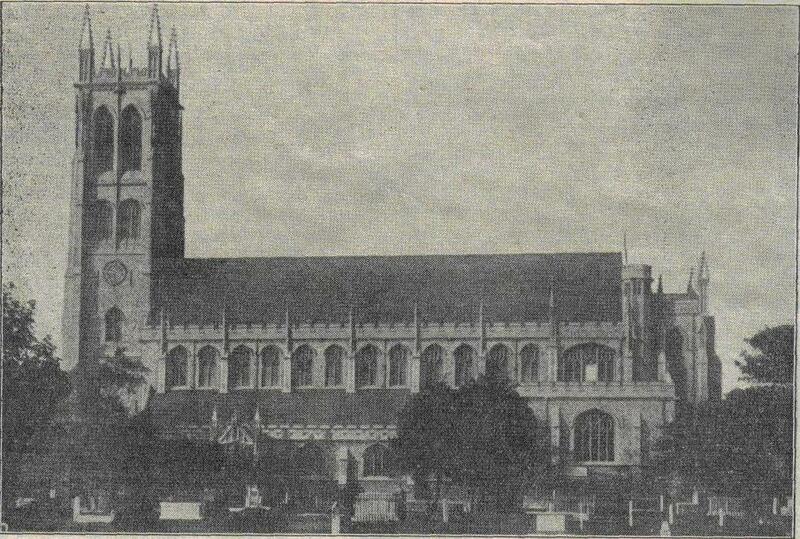 Mr. W. Noice (secretary of the Winchester District) wrote pointing out that it was proposed to erect a memorial in the Cathedral to Canon Madge, who was one of the founders of the Winchester Guild, and suggesting that the Guild should give a donation. It was resolved that a sum of one guinea be contributed. The Master said it would be open to the Guild to do something independently. He would like to see some memorial to Canon Madge worthy of the Guild in the tower. Mr. B. J. Snow (hon. secretary, Isle of Wight District) proposed that a grant of five guineas be given to the bell restoration at Godshill, Isle of Wight. They had there a very keen band of twelve ringers, and it was hoped that while the old six bells were being restored two additional pits would be provided in the new iron frame, so that trebles could be added in the future. The Master said the committee recommended this grant, and the meeting agreed to it. A recommendation was carried that first peals, first peals a new method, etc., should be shown by conductors when sending reports of peals to the ringing Press. The Editor of "The Ringing World" was welcomed by the Master and he was thanked for his attendance, on the motion of Mr. W. J. Tucker, who took the opportunity of urging all ringers to become subscribers to the paper. This terminated the business, and the members then attended service in St. Mary's Church, the Guild Office being conducted by the Vicar (Canon G. C. L. Lunt). The preacher was the Lord Bishop of Portsmouth (Dr. E. N. Lovett), who, speaking from the floor of the church, said was very pleased to see such a large gathering in view of the other events taking place in the adjoining diocese. He was quite certain, he said, that the work the ringers were doing for God's glory on earth was part of the glory in which they would stand, over yonder. Basing his address on the words, "A bell and a pomegranate" (Deut. xxxviii. 24), he pointed out that this text was evidence that the bell had been used in connection with worship from the days of the children of Israel, and from the third century of the Christian era bells had been used to call people to worship and to mark Sunday. It had been the custom in many parishes for hundreds of years to ring the bells at eight o'clock on Sunday morning, whether there was a celebration of Holy Communion or not, to tell the people that it was Sunday. The tongues of the bells were intended to proclaim holy things, said the Bishop, but they could not do so without the help of the ringers. God worked through them. There were probably several answers to the question why they liked ringing. They enjoyed it, and they might do much worse things for enjoyment than that. They might also say it was an art. An art was something which came out of their life, and those who listened were appealed to in proportion to the skill which the ringers put into it. All art was precious to mankind, because art came from what was best in the mind of man. But ringing was not only a pleasure and an art, it was also a privilege. God had given them the art and skill, and it was a privilege to be one of those who summoned the Christian Church to worship. There were some people who grumbled about bells, but all the same, if an attempt was made to silence the bells of England, they would get an enormous majority who would say, "By no means. We should be sorry indeed to be without bells and without our ringers." They played a part in English life and did it for the glory of God. While churchpeople were exceedingly grateful to those who rang the bells, the ringers ought to be grateful that there was something so definite and clear that they could do to witness to the importance of church worship. He did not think ringers would differ from him when he said they should live up to their high office. He had had splendid teams of ringers at four different churches, where there had been peals of bells, and he always liked to think of ringers as men against whom nobody in the parish had anything to say. Ringers should bear in mind that they were witnesses of God, and had to try to live up to a high standard. They should go on ringing, he said, as much as they could - it was worth it in the very perplexed world in which they lived.They had the art; they had the opportunity; they had trained themselves in skill; it was real good work for a good purpose. It was also something to help them to remember that men's lives must be like a bell all the time - they had to be hung level and had to swing level, and if they did this all through life they would be doing the will of God. At the close of the service, the Bishop shook hands with all the ringers as they left the church, and enquired where they came from. Tea was served on the lawn of the Vicarage, the company being joined by Canon Lunt, to whom a vote of thanks was proposed by the Rev. Evan Jones. During the evening there was ringing on the bells of St. Mary's Church, which last year were recast and rehung by Messrs. Taylor and Co. at the expense of the Barron Bell Trust.